We all had one, there is no denying it. Whether you were a four year old wearing the Zooey Deschanel straight-across bangs against your will, or a twelve year old who got a little scissor happy does not matter. My bang phase and the "dark" period of my life are directly correlated. And for as much as I dread remembering my few year stint with bangs, I sure do like to bring it up an awful lot. In sixth grade, I got sick of my hair being one length with a boring center part sometimes adorned with a really cheap and heinous headband. One day, I experienced ten seconds of pure courage (or maybe that was just stupidity) and took a piece from each side of the part and snipped it off somewhere around me ear. That left me with two awkwardly uneven side bangs (if you could even call them that). Oddly proud of myself, I threw the pieces of hair into the garbage can, smoothed my hair back into a ponytail so my mom would not notice what I had done. The next day at school, my friend at the time saw the disaster I made and tried her best to fix the wonky side bangs I had cut myself the night before. They looked better than before, but if you saw them in person, you'd have to wonder how truly awful they looked before the fix. Flashforward two years to eighth grade. I was virtually friendless, had terrible style (I still wore Abercrombie, enough said), and to top it all off, my hair reacted poorly to a botched highlighting job that my mom did and turned copper orange the week before school pictures. The same day of the botched dye job, I decided that I wanted bangs because Demi Lovato had bangs. I didn't just want side bangs again. No, I wanted full-on bangs that covered my entire forehead and would cause me years of trauma following. Looking back on this, why did my mother not tell me that bangs would be the worst decision I would ever make in my life? I understand that she wanted me to express myself however I wanted and probable felt bad telling me no, but if you saw these bangs in person, you would wonder the same thing. I had these bangs until halfway through my sophomore year of high school. They got a little longer and shaggier with time and eventually migrated to the opposite side of my head. 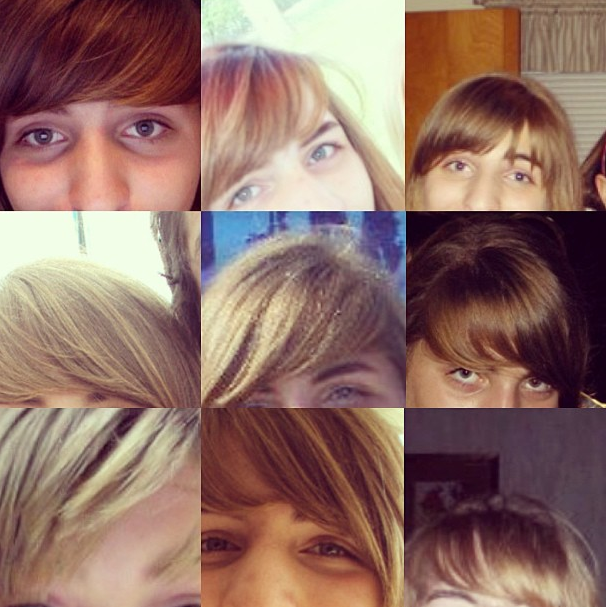 It pains me to do this, but I think I may have to insert a collage of my bangs. Only this will truly should how painfully hideous they were. If you have vomited after viewing such a vile image, I truly apologize. I take full responsibility for any nightmares that may follow as well. Bangs just were not for me. I spent three years of my life thinking that I could rock bangs and that I was totally a bangs girl. In reality, I was more of a deep side part, no bangs kind of girl. Maybe someday, if I'm really wasted, I will get bangs again and repeat the cycle. For now, I will keep scissors far away from the hair framing my face. Have you had any bad experiences with haircuts, whether it be bangs or a bad style? Tell me what your biggest hair regret was in the comments below.